CAPE CANAVERAL, Fla. — Following the successful launch of a communications satellite on May 11, 2018, from Kennedy Space Center SLC-39A, SpaceX is scheduled to launch another communications satellite from Florida on May 31, 2018, this time from nearby Cape Canaveral Air Force Station’s SLC-40. The customer is SES, a giant European communications conglomerate. If everything goes as planned, this will be the sixth launch of an SES satellite by SpaceX. According to the World Teleport Association (WTA), SES is the second largest (by revenue) communications satellite owner/operator in the world, surpassed only by Intelsat, S.A. Founded in 1985 and headquartered in Luxembourg, SES operates more than 50 satellites that reside in geostationary orbits and another 16 medium-Earth orbit satellites. These spacecraft serve broadcasters, internet providers, mobile and fixed network operators, governments, and institutions in North America, Latin America, Europe, Africa, the Middle East, and the Asia-Pacific region. Forty-three SES communications satellites are parked in geostationary orbits about 22.000 miles (35,406 kilometers) above the equator, ranging from 177 degrees West (NSS-9) to 176 degrees East (NSS-11). According to the website Satellite Signals (www.satsig.net), there are about 450 active satellites in geostationary orbit above the equator, giving SES about a tenth of that total. For those who may be wondering if that imaginary geostationary “circle” above the equator may be getting too crowded, 450 satellites equally spaced 22,000 miles above the Earth would be about 365 miles (587 kilometers) apart – the distance between Los Angeles and San Francisco. 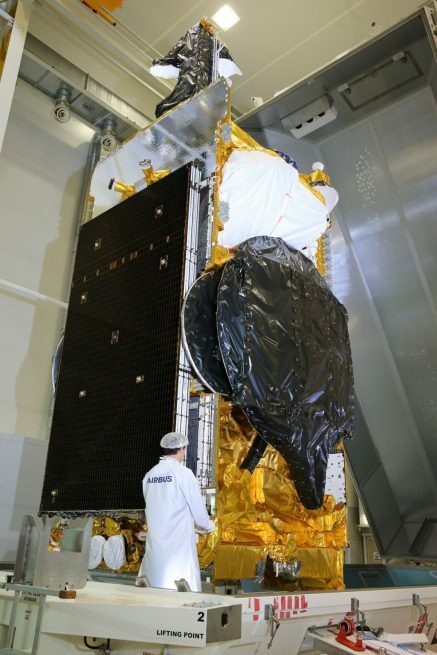 Airbus, a European multinational company that designs, manufactures, and sells civil and military aeronautical products worldwide, built the SES-12 satellite. In addition to Earth satellites and other space-related equipment, Airbus also produces commercial aircraft, helicopters, and military fixed-wing aircraft. In fact, Airbus has delivered nearly 11,000 aircraft to commercial airlines, and 12,000 helicopters to various customers. Airbus has manufactured more than 100 communications satellites for a wide range of customers worldwide, and is the largest manufacturer of Earth observation systems with more than 50 satellites launched to date and another 18 currently under construction. SES-12 will have a dual mission. It will replace the NSS-6 satellite in orbit, providing television broadcasting and telecom infrastructure services from one end of Asia to the other, with beams adapted for six areas of coverage. It will also have a flexible multi-beam processed payload for providing broadband services covering a large expanse which includes Africa, Russia, Japan and Australia. SES-12 is designed to operate in the Ku and Ka bands with a total of 76 active transponders, and will be equipped with eight antennas. It will have a launch weight of 11,685 pounds (5,300 kg), the largest of any SES satellite to date, and an electric power capability of about 19 kW. Its electric propulsion system should enable it to reach its geostationary orbit in three to six months. Its nominal operational position will be 95° E and it has been designed to remain in service on orbit for about 18 years. According to SES, the SES-12 satellite should expand SES’s capabilities to provide direct-to-home (DTH) broadcasting, VSAT, Mobility and High Throughput Satellite (HTS) data connectivity services in the Middle East and the Asia-Pacific region, including rapidly growing markets such as India and Indonesia. Once it arrives in its planned destination, the satellite will replace NSS-6 at this location and will be co-located with SES-8. SES-12 is capable of supporting requirements in multiple verticals from Cyprus in the West to Japan in the East, and from Russia in the North to Australia in the South. SES-12 will be parked some 22,000 miles (35,406 kilometers) above the Indian Ocean, directly over the equator, about 500 miles (805 kilometers) west on the eastern-most land mass of Indonesia. Just as a frame of reference, the altitude of SES-12 will be about 100 times farther from the Earth than the International Space Station (ISS). 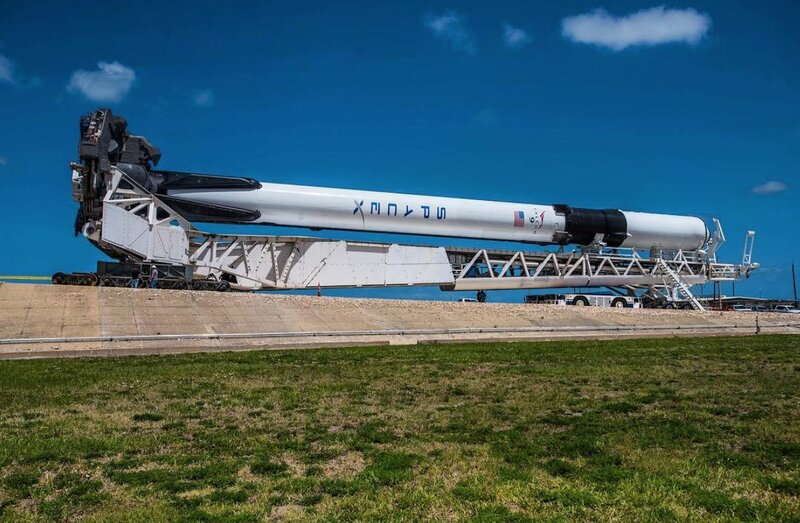 The satellite is to be launched atop the Block 4 variant of the Falcon 9 ‘Full Thrust’ rocket. If everything goes as it is currently planned, this will be the 11th flight of the Block 4, which was first flown on August 14, 2017 for the CRS-12 mission to the ISS. The refurbished B1040 first stage booster was previously flown nearly nine months earlier on the Boeing X-37B OTV-5 mission, launched on September 7, 2017. SpaceX is reportedly not planning to retrieve that booster, consistent with their apparent strategy to limit Block 4 and earlier booster flights to two. In contrast, as revealed by Elon Musk in his May 10, 2018 teleconference, SpaceX plans to fly Block 5 boosters (first flown on the May 11, 2018, Bangabandhu-1 mission) ten times before major refurbishment. The next SpaceX launches From Cape Canaveral Air Force Station SLC-40 are currently: CRS-15 – a resupply mission to the International Space Station (June 28) and Telestar 19V (slated to fly in late June). I note that there is a predominance of AIRBUS mentions but nothing of BOEING. Why please? Mr. Sharp, SES-12 was designed and manufactured by Airbus Defence and Space. The Falcon 9 rocket was designed and manufactured by SpaceX.